The graph below tells you what age the Office for National Statistics (ONS) thinks you might live to. First, blue is for men and red/orange is for women. Then, the ONS’s principal projections are shown with solid lines, while the dotted lines give their more optimistic (high life expectancy) scenario. If you’ve chosen your gender and high/central projection, you are left with two lines. One is your life expectancy now, the other is what it would be if you reached 65 (as it can be more useful to think about what happens if you get to roughly pension age and ignore the odds of dying before then). The U-shape may seem surprising – you might think that younger generations would always have the longest life expectancy – but if you are already 90 then it makes sense that you have a good chance of reaching 92, for example. So the first thing to note is just how long people can expect to live! The boys and girls going into primary school now should on average live to see the 22nd century. This underlines for me the importance of investing in human capital: good education will pay off decade after decade for individuals, the economy and society, while the costs of failure are equally long lasting. The long timeframes are also reflected in the uncertainty of these figures. We can only guess at what the state of health and medicine (including regenerative medicine and life extension) will be in a few decades’ time, let alone 2100 and beyond. But my guess is that the ONS’s central projection will on the whole prove to be too pessimistic, as all previous UK government and UN projections have. Note that a quick search for the UK’s average life expectancy would usually give a number of around 80. How can that be if every figure in this graph is above 85? Well, the lower figure is a ‘period life expectancy’. This uses mortality rates as they stand at the moment – effectively assuming that medicine immediately stops improving and that younger generations have no health advantages. This can be a good indicator of a country’s health in general. 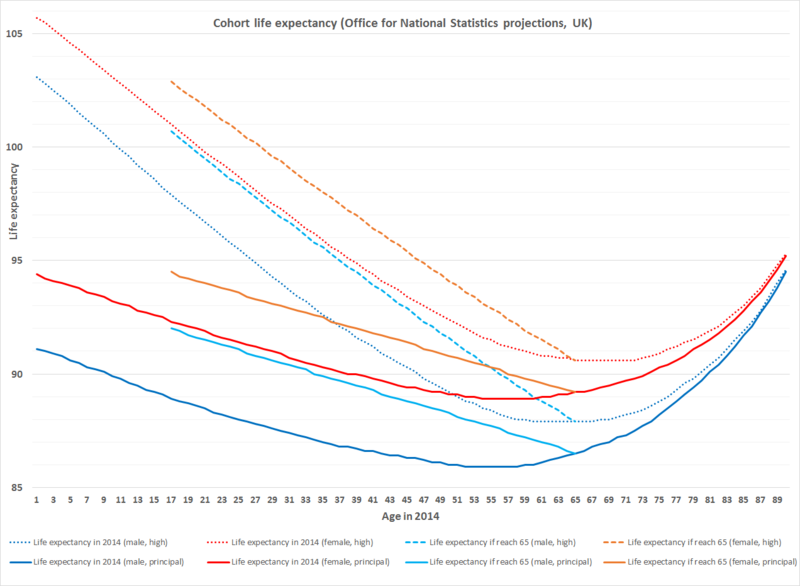 But it is not particularly useful for those wondering how long they might live: the ‘cohort life expectancies’ in the graph are much more meaningful, albeit dependent on assumptions about future death rates. The use of period life expectancies – which can be around a decade lower than cohort measures – may have contributed to our general cluelessness about how long we can expect to live, and therefore how much we need to save, what pensions we can expect and how long we need to work. The ONS figures used in the graph will in future help determine the State Pension Age, based on a new link to life expectancy, with the intention that the state pension should not on average be drawn for more than one third of adult life. For example, you can see in the graph that those who are 65 now are expected to live to about 87.5. A State Pension Age of 65 for them would mean 22.5 years of retirement, after 45 years of working ‘adult life’ – so the one third ratio works for them. The table below (using the full ONS dataset) takes a look at what this principle would mean for future pension age increases, following recent stories about a pension age of 70. I’ve also included the high life expectancy projection, which under this rule would push the pension age to 70 in 2033 and 74 in 2058. Notably, currently legislated pension ages appear to be too generous – i.e. those retiring at 65, 66, and 67 will likely spend more than a third of their adult life receiving the state pension: a breach of the new principle. This could represent a form of intergenerational unfairness, but a further, reasonable principle of giving at least 10 years notice before people reach pension age means these dates are unlikely to change. The table also suggests two reassuring points about the pension age potentially hitting 70. Firstly, that it would happen in the 2060s (using the principal projection), meaning it would only apply to those currently under 21, at most. And secondly, that far from pushing the pension age to death’s door, those pensioners could expect to live to 95 on average – and drawing an ample state pension for 25 years doesn’t sound too miserly. Rather, the question is whether we’re paying in enough to expect such largesse. Of course, these average life expectancies conceal large variation and unfairness. As I’ve written before, there is a sizeable gap in life expectancies between unskilled manual labourers and professionals, for example, or between Glasgow and Kensington & Chelsea, and more work is needed to both avoid and take account of these inequalities. But pretty much everyone, across the UK and indeed the world, can basically look forward to longer lives than ever before, and we all need to plan for that. – The chart excludes those over 90 (who are relatively few), and those under 1 (as their statistics are more affected by child mortality). – Life expectancy at 65 is not available for the youngest cohorts, and not meaningful for those already over 65. – Given my belief that the principal projection will prove an underestimate, I have not included the ONS’s ‘low life expectancy’ projection. – Pension age increases will be phased in. The dates in the table show when the transitions would be completed. – In calculating when the pension age might change, I have for simplicity assumed a 50:50 gender split at the pension age. The dates would come slightly earlier if there are more women than men at this age.